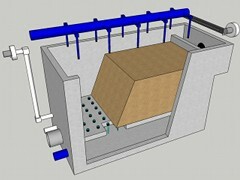 The 'dry' rapid sand filter is a container with sand. The water is spread over the sand with sprinklers. Because oxygen is added to the water the iron and manganese will oxidise and turn into flakes. These flakes are captured by the sand. The ammonia in the water is removed with the help of bacteria. A ventilation system is used to pull "fresh" air through the sand to provide enough oxygen to the bacteria. 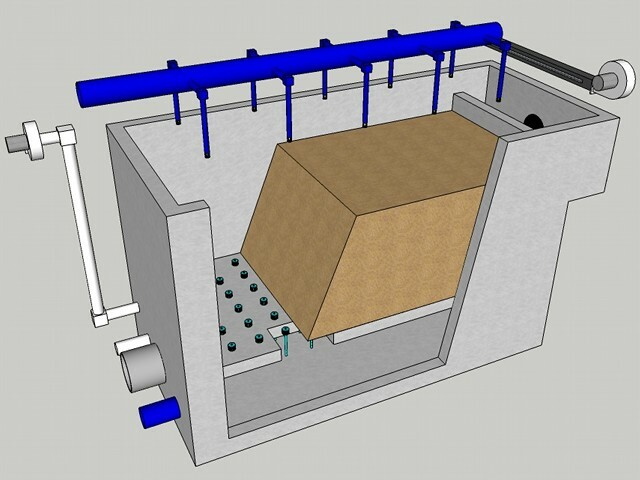 Look at an video presentation of a rapid 'dry' sand filter.